Hi folks. I am pleased as punch to be here with you all today. When Katherine asked me to guest post for her I have to say I was overjoyed. And mildly concerned about her mental health. I mean this lady takes food to a whole different level. She makes beautiful dishes and takes breathtaking photos. Surely she had the wrong email addy or something. Never one to pass up a great opportunity I jumped all over it before Katherine came to her senses. I mean if she really had bumped her head or something I wanted the deal signed and notarized before she recovered. That’s just how we roll up here in the asylum. So for those who do not know me, I am Kim Bee, the nutball who runs Cravings of a Lunatic. I have been a stay at home Mom for 23 longggg years and now that the hooligans are older I am busting out of my strait jacket to go after my own dreams. Those dreams have always revolved around food. I love food. I love baking food, cooking food, talking about food, eating food, taking photos of food. It’s my passion in life. Well that and Timothy Olyphant but just don’t tell hubs about that. It’s our little secret. So I made this strawberry tart. I did not do the typical mascarpone cheese you would normally see with a tart like this. The reason is my daughter, who I like to call mini-me, is super picky. I was hopeful she’d try this tart and I knew if I did a ricotta, sour cream, or mascarpone that she probably would not try it. So I went with something a bit out of the box for a tart. I used Fluff. Yup, that’s how we do it here at the Bee household. Just a little off kilter to keep you guessing. It turned out fab! I even did a little bunny just for fun in honor of Easter weekend. 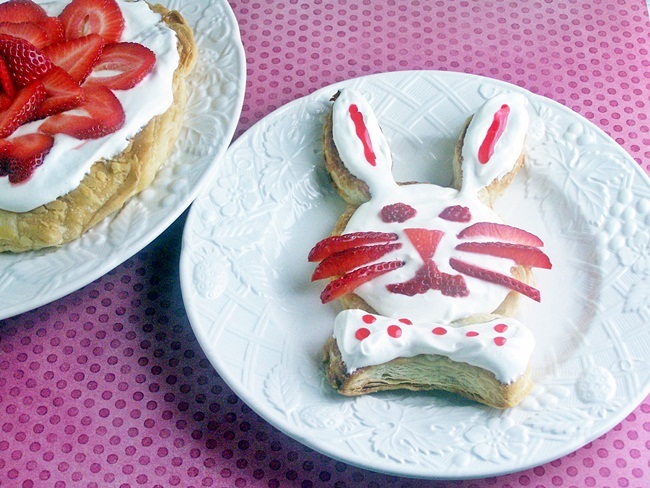 Hope you enjoy the Strawberry Tart and the Strawberry BunnyTart. Kim's recipe for this gorgeous strawberry tart is a bit unorthodox and I love it. Her secret ingredient? Fluff. And how cute is that BunnyTart? Make large circular tarts, almost the size of a mini pizza. Brush the surface with the egg white. Prick the pastry a little bit with a fork. Lay the pastry on a parchment lined cookie sheet. Set inside your fridge for about 30 minutes. Take out and pop in your preheated oven. Cook for 12 to 15 minutes, or until light golden brown. Remove from oven. Let cool briefly while you whip up the filling. Now mix up your marshmallow filling by combining the cream cheese and fluff in a mixer, use a whisk attachment and beat till fluffy. Spread that filling over the tart. Lay your sliced strawberries over top. Now if you want to do bunnies, it is super simple. Just roll out your dough into smallish circles. Take a glass and press it into the dough. Do this twice for each bunny. Now lay one circle on a parchment lined cookie sheet. Then take your other circle and with a pizza cutter you want to cut the ears out of the circle. If you do it at each end you'll have two ears and bow tie left. Sounds hard but it's super easy. Now cook and assemble as you did above, except you want it to look bunny-esque. I’d like to thank Katherine for having me today. I wish you all well this Good Friday. Hoppy Easter everyone! Thanks so much for having me Katherine. It was a pleasure. Hoppy Easter! D’awwww, Kim, what an adorable tart! 🙂 Awwwww. Thanks so much Kiri. This was too much fun. Love Easter! Thanks. We use it as dip for fruit all the time so I thought why not try it on puff pastry. What a cute bunny! I love the strawberry whiskers!! Thank you so much. They kept falling over. He has twitchy whiskers. Lol! I’m so envious you’re in Istanbul! It’s such a great city! Enjoy your time there! Thanks Soni. It is so easy and almost too cute to eat. Almost…. Katherine, I hope you are enjoying your holiday!!! Kim, you have mastered puff pastry! Beautiful AND yummy tart. Happy Easter, my friends!!! Hi! Happy Easter! I have Hat Cookies today. So many great link ups! I saw the photos over on Kim’s blog this morning–the bunny is too cute. This would make a great light holiday dessert! Thanks. Even mini-me tried these which is a huge deal. She’s so picky. Nothing like her mother *cough*, not at all! Katherine and Kim, I adore you both. Great guest post Kim, the bunny is too cute! Thanks Kelsey. I had a little fun with this one. How cool to see you here Kim and that is an adorable tart you’ve made, so cute. Hope you are enjoying your vacation Katherine and a wonderful weekend to you both. Thanks so much Suzi. Hoppy Easter! Kim – this is AWESOME! I love the tart and I’m SO excited to see you and Katherine together again! Have a GREAT time in Istanbul, Katherine….Kim will take good care of us while you’re gone! Thanks Ann. I adore Katherine so any opportunity to do anything with her is a special treat for me. That’s especially funny because I immediately started singing that song in my head as soon as I read the word Istanbul!! How very sweet! Lovely to meet you. Wishing you all a very happy Easter! You’re a brave gal Kim Bee! Doing a guest post on something relatively new to you! 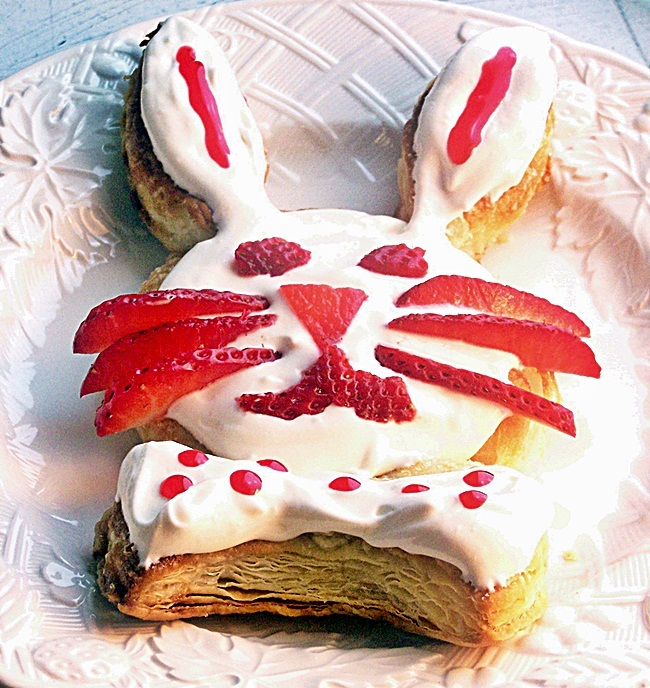 Great looking puff pastry bunny! It’s SO cute and SO Easter! Great strawberry tart and wonderful post ladies! I’m serving the asparagus that I linked up for supper tomorrow so I guess it’s appropriate for an Easter Hop. 🙂 Happy Easter everyone! That’s great that you’re in Istanbul! There is so much delicious food there! Have a wonderful time! Enjoy the eggplant dishes, beurreks, baklava that is really buttery with just the right balance of syrup and lots of pistachios, savory Turkish breakfast rolls with feta cheese, kaymak – yum! What a cute bunny and lots of delicious linkup! You can never go wrong with puff pastry, I always say – and you’ve proved it in spades, Kim. Great job for only your 2nd time! Even if puff pastry doesn’t turn out the way you envision (mine doesn’t always), the mistakes are so delicious that I don’t really care. Nice post, and now I’ve got a new blog to check out! I love this cute bunny tart! Cream cheese and marshmallow also sound like very original ingredients here! Wonderful post and scrumptious photos, Kim! Great link up. a lovely puff pastry recipe. Hope you are enjoying your travels. Thanks to everyone for their sweet comments. I am so happy everyone enjoyed this. Hope you all had a great Easter weekend. The bunny looks so adorable and yummy!! Hope you’re having a wonderful trip, Katherine! 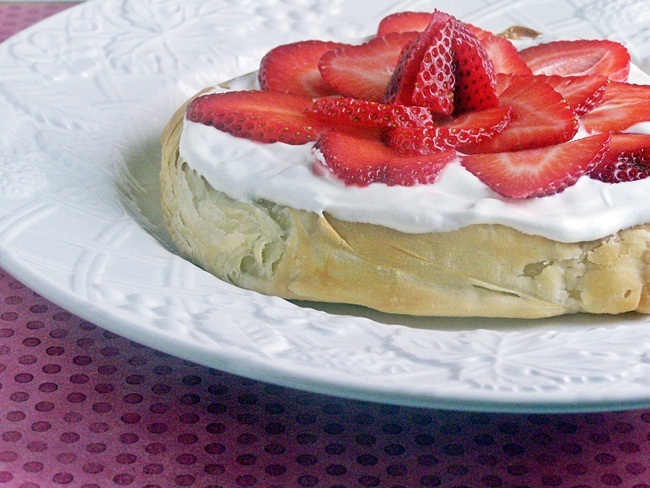 I really enjoyed Kim’s guest post – hooray for puff pastry, and what a cute tart!